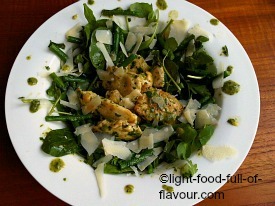 I really like a warm salad - like this sensationally tasty warm chicken salad which I serve with a rocket (arugula) and mustard dressing and Parmesan cheese shavings. I always have a piece of really good Parmesan cheese in my fridge. The darker the parmesan cheese is, the longer it has been matured and the tastier it is. And yes, more expensive as well! The taste is so intense though, that you don’t need to use a lot. It’s the same with good balsamic vinegar – a little bit goes a long way. With my big appetite, there’s no way I could eat nothing but this warm chicken salad and be content. As the salad is very green, I like to serve it with fried tomatoes on sourdough or some other good bread. What I do is cut ripe, small tomatoes into quarters. I then fry them for a couple of minutes in a little bit of olive oil, add a good splash of balsamic vinegar and some salt and pepper and fry it all for a further couple of minutes. 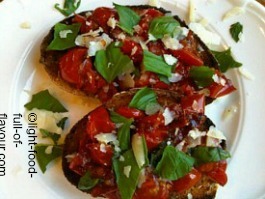 I serve it on toasted bread with some shredded basil leaves and some of the lovely Parmesan cheese shavings on top. 1. Preheat the oven to 200C/fan180C/400F/gas mark 6. Start by making the dressing. 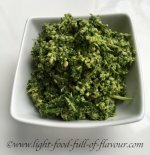 Place all the ingredients for the dressing in a food processor and whizz together. 2. Toss the chicken strips with the tablespoon of olive oil and some salt and pepper in a bowl. Brown the chicken strips on both sides in a frying pan over quite a high heat – you will have do this in batches – and transfer to a roasting tray when done. Once all the chicken is done, place the roasting tray in the oven and cook for 5-7 minutes, or until the chicken is cooked through. 3. While the chicken is cooking in the oven, get some water boiling in a pan, add fine green beans and simmer for 4-5 minutes, then drain. 4. Toss the hot beans and chicken with the dressing in a bowl. Divide the lettuce between four plates, Place the warm chicken and beans on top and scatter over the Parmesan shavings. Serve the warm chicken salad straight away.